Rail staff at a Lancashire station are on strike this weekend after a worker was sacked for allegedly putting hand gel in a supervisor's coffee cup. About 50 people attended a protest at Blackpool North after Chad Vickers was fired from his post, the Rail, Maritime and Transport union (RMT) said. It added that the police found "no evidence at all" and his removal by Northern Rail was a "farce". The rail operator said it was "confident this dismissal was fair". 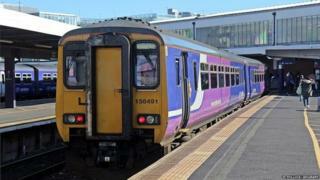 Adrian Thompson, human resources director for Northern Rail, added: "We never rush to dismiss our staff. Dismissal is always a last resort." The union's general secretary Mick Cash said: "There is no compelling CCTV evidence, the police found no forensic evidence and management could come up with very little in anecdotal evidence to support the decision to dismiss Chad." Northern Rail said it would continue a normal service this weekend despite the 48-hour strike, which started on Saturday midnight.